(L-R) Jenny Gregg, Fergal Kelly and Erin McEvoy with horse Elvis as they prepare to travel to Philadelphia to pitch Crafted Equestrian to international investors. A team of entrepreneurial Ulster University students are currently in Philadelphia to pitch their innovative equestrian products to an expert panel of international investors today as part of the Maguire Hegarty LLC International University Student Pitch-Off Competition. Identifying an unrealised gap in the equestrian market to improve the health of her horse Elvis, international horsewoman and product and design student Jenny Gregg (21), initially created a customisable girth that has a unique pressure relief system which can potentially improve horse performance, avoid rider disappointment due to missed competitions, negate costly vet bills, and most importantly improve horse welfare and comfort. After bringing the new product to Ulster University and securing funding from Innovation Ulster Limited, the business development team alongside student experts in engineering, design and retail worked collaboratively to establish Crafted Equestrian and patent the horse girth product in a bid to bring it to market. 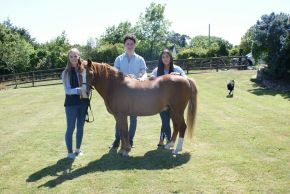 The inter-faculty support team of students was born out of their shared passion for business, design and a love for horses and includes international equestrian rider and product design student Jenny Gregg (21), graphic design student Fergal Kelly (24) and international business student Erin McEvoy (23). As well as pitching to international investors, the team will also be touring leading Veterinary Clinics in Pennsylvania and will visit Cabrini University, to deliver a practice pitch to a panel of faculty and industry experts in preparation for the competition itself, as well as catching up with Ulster University alumni in the Philadelphia / Pennsylvania area for breakfast meetings. The team has also been supported by Derry City and Strabane Council and assisted by engineering student Paul Doherty.